There’s little point to writing about The One I Love — the intimate new head-scratcher from Charlie McDowell and Justin Lader — without mentioning the infidelities that the film commits. Prior knowledge of these infidelities may affect your willingness to let the film court you, or to wed yourself to it. Or perhaps not. Maybe you’re not looking for something so serious? Maybe you just need a fling, something new? 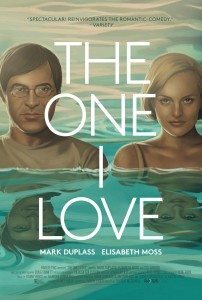 In The One I Love, Ethan (Mark Duplass) and Sophie (Elisabeth Moss) creak through couples counseling. Ethan cheated on Sophie; Sophie struggles to move past the betrayal. 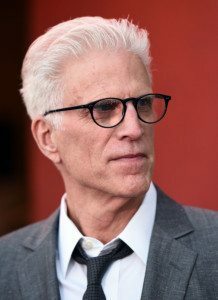 Their therapist (Ted Danson) suggests they weekend at a remote rental house in order to bring back the magic. It brings back the magic. To say more — which I’m about to do — necessitates revealing the trick of The One I Love. In the film, revealing the mechanics of tricks is something that Ethan enjoys doing, much to Sophie’s ongoing discontent. Decide which of the pair you relate to and either read on or ride off. I’m sure the filmmakers would prefer you go in cold, but I’m also sure they’d prefer that you go in in any case. It’s a two-way relationship. Don’t go changing just for them; it won’t work out. 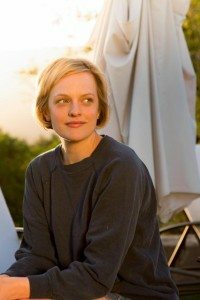 Elisabeth Moss has come a long way since the West Wing. I’m glad. At the gorgeous vacation house, Ethan and Sophie do their best to reconnect. At first, this entails simple things like cooking together and getting high. Then Sophie wanders out back to the guest cottage on the property where Ethan says and does all the right things. The magic comes back, in and out of bed. Then Sophie returns to the main house to grab her pajamas and finds Ethan asleep on the couch in front of the television. When she wakes him up, he denies having just spent a glorious evening with her — because he didn’t. They fight. The magic is spoilt. Then Ethan has his own experience in the guest house, with a Sophie who’s just like Sophie, but more-so. Our original pair — let’s call them E1 and S1 — get sketched out, they bug out, and then, on Sophie’s suggestion, they return to the vacation house to investigate whatever this other-worldly weirdness is. That’s the premise: a couple on the rocks goes to a house where they meet their much improved doppelgängers. Due to the unexplained rules of the strange phenomenon they’re experiencing, only one half of the couple can enter the guest house at a time, at which point the other is locked out. The science-fiction rambles from there, but that’s not so interesting or important. What’s very interesting about The One I Love is its novel perspective on couple-hood. It is essentially a film about the people we fall in love with and the people we end up loving. As you might imagine, through the course of the film, tensions arise as to whether S1 and E1 are better off with each other, or with each other’s more attractive, more attentive, more available counterparts who are locked away in the guest house. This dilemma does not play out predictably, or even necessarily sensibly, but then Ethan and Sophie aren’t feeling particularly sensible. They’ve found out their wife/husband is cheating on them with superior versions of themselves. That’s a rough ride down a rocky road. 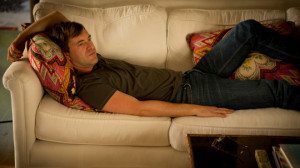 As the near sole performers in the piece, Duplass and Moss do exceptionally well. Duplass one ups Moss in bifurcating himself into morosely shabby and unctuously chic duplicates. Moss one ups Duplass in expressing the turmoil her original self experiences, but the emotional output of her doppelgänger’s lags — although, to be fair, that’s an outcome demanded largely (and wisely) by the script. For it is Sophie1 that falls for Ethan2. Ethan2 is a man who expresses heartfelt regret for his marital lapses. He speaks honestly, they way Ethan1 once did. He is also willing to say and do all the things that E1 balks at. He is new. He is also — to a degree that’s debatable — a phony. These two creatures are not mystical beings or travelers from another dimension. They are, in some strange way, other people — another couple who has come to this house, perhaps under identical circumstances — who have been trained by the Therapist to perfectly mimic their replacement guests. The mechanics of this nonsense isn’t explained, nor should it be. It’s just a literary device. But while we are told, and from evidence it appears that E2 has fallen for S1, I do not trust him. He was supposed to help trap E1 and S1 in the guest house so he and S2 could escape and take over the others’ lives — only with the magic returned! In Sophie’s emotional state, it isn’t difficult to imagine that she’d fall hard for the man she married, only now dramatically scrubbed of flaws. The inverse is less digestible. Who is this Ethan2 that — after only a day or so of brief visits — he falls in love with the wounded woman whom his own wife can and will imitate only without the downside? It is a fascinating, infuriating, perplexing puzzle that leads only to other — more personal, subjective — puzzles. These contemplations get compounded by the fact that Ethan1, having interacted with Sophie2 — who’s just as improved upon Sophie1 as Ethan2 is upon Ethan1 — couldn’t care less about her. She is not his wife. She is an impostor and he is only concerned with a) retaining the love of his wife and b) uncovering the mystery of who these pod people are. I saw The One I Love with the one I love, currently carrying our first child. We’ve been married for near nine years and I’m not as peppy, or light-hearted, or romantic as I once was. Luckily, I’m just as bald as when she met me, so no issues there. More than anything, though, what I’m not now that I once was is new. The inverse is also true. My wife is not nearly as new to me as she was when we first met. So ask yourself, if you’re part of a longterm couple, would you take the new or stick with the known? I know my answer and I relate to Ethan1. I see how Sophie1 could be seduced by the new, but she’s making a mistake. New is one thing that cannot last. Known lasts. Others’ flaws evolve and spread like cracks in plaster, and that’s what mitigates our own flaws. Ethan2 may seem perfect now, but in a year, or three, he’ll be as familiar as Ethan1, only he’ll still be a phony. And trying to recapture the magic that was only ever a fabrication. In the end, sci-fi shenanigans dodge rationality, and Ethan escapes the house with his wife, after Sophie2 helps him overcome the plotting of Ethan2 — she loves Ethan2 and wants him for herself. But she doesn’t. More than anything, what she wants is out of the house. The Sophies silently, tacitly switch places and Ethan doesn’t notice until he’s home, happy, back in the magic of love. What should he do? Will what he has now last? Is the result as inevitable as a tic-tac-toe tie? Can he jump back into the forbidden pool of first love and get the same romance, the same ripples? What if it’s with the same partner, only new? The One I Love does not come down hard on Ethan, or on Sophie1, or on any of them for the way they struggle through love. It just offers you a new vantage from which you might explore what you want, what you need, and what feels like magic. It’s not perfect; it’s not eternal; but it is new. And new is seductive. I liked The One I Love quite a bit. I wonder if that affection will last.